You can use the setup wizard in the Office 365 admin center for an IMAP migration. 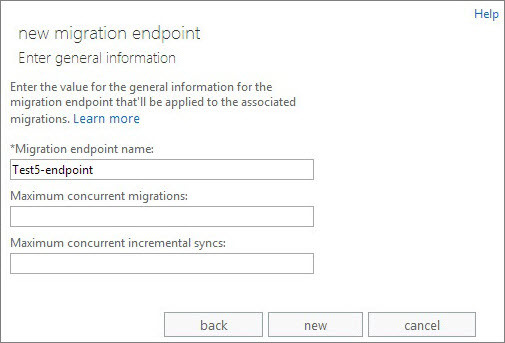 See Use the Office 365 Setup wizard to perform an IMAP migration for instructions. Before Office 365 can connect to Gmail or Google Apps, all the account owners need to create an app password to access their account. This is because Google considers Outlook to be a less secure app and will not allow a connection to it with a password alone. For instructions, see Prepare your Google apps account for connecting to Outlook and Office 365. You’ll also need to make sure your Google Apps users can turn on 2-step verification. In this task, you’ll first verify to Office 365 that you own the domain you used for your Google apps accounts. NOTES: Another option is to use the your company name.onmicrosoft.com domain that is included with your Office 365 subscription instead of using your own custom domain. In that case, you can just add users as described in Create users in Office 365 and omit this task. Most people, however, prefer to use their own domain. Domain verification is a task you will go through as you setup Office 365. During the setup Office 365 setup wizard provides you with a TXT record you will add at your domain host provider. See Verify your domain in Office 365 for the steps to complete in Office 365 admin center, and choose a domain registrar from the two following options to see how to complete add the TXT record that your DNS host provider. Your current DNS host provider is Google. If you purchased your domain from Google and they are the DNS hosting provider, follow these instructions: Create DNS records when your domain is managed by Google. You purchased your domain from another domain registrar. If you purchased your domain from a different company, we provideinstructions for many popular domain hosting providers. IMPORTANT: At this point you have verified that you own the domain and created your Google Apps users and mailboxes in Office 365 with your custom domain. Close the wizard at this step. Do not proceed to Set up domain, until your Gmail mailboxes are migrated to Office 365. You’ll finish the setup steps in task 7, Route Gmail directly to Office 365. When you create the migration file, you need to know the password of each Gmail mailbox that you want to migrate. We’re assuming you don’t know the user passwords, so you’ll probably need to assign temporary passwords (by resetting the passwords) to all mailboxes during the migration. You must be an administrator in Google apps to reset passwords. You don’t have to migrate all Gmail mailboxes at once. You can do them in batches at your convenience. You can include up to 50,000 mailboxes (one row for each user) in your migration file. The file can be as large as 10 MB. Sign in to Google admin console using your administrator username and password. After you’re signed in, choose Users. Select each user to identify each user’s email address. Write down the address. Sign in to the Office 365 admin center, and go to Users > Active users. Keep an eye on the User name column. You’ll use this information in a minute. Keep the Office 365 admin center window open, too. Next enter the email address, user name, and password for each mailbox you want to migrate. Enter one mailbox per row. Column A is the email address of the Office 365 mailbox. 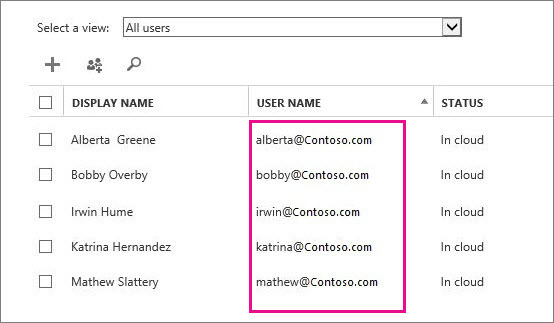 This is what’s shown in the User name column in Users > Active users in the Office 365 admin center. Column B is the sign-in name for the user’s Gmail mailbox—for example, alberta@contoso.com. Column C is the app password for the user’s Gmail mailbox. The app password was created in the Prepare for migration step. You use a migration batch to migrate groups of Gmail mailboxes to Office 365 at the same time. 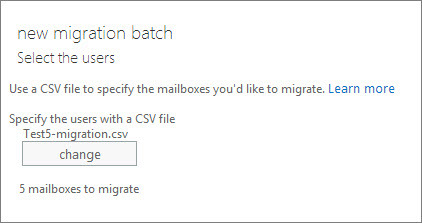 The batch consists of the Gmail mailboxes that you listed in the migration file in the previous task. TIPS: It’s a good idea to create a test migration batch with a small number of mailboxes to first test the process. Use migration files with the same number of rows, and run the batches at similar times during the day. Then compare the total running time for each test batch. This helps you estimate how long it could take to migrate all your mailboxes, how large each migration batch should be, and how many simultaneous connections to the source email system you should use to balance migration speed and Internet bandwidth. It doesn’t contain more than 50,000 rows. If any one of these checks fails, you’ll get an error that describes the reason for the failure. If you get an error, you must fix the migration file and resubmit it to create a migration batch. 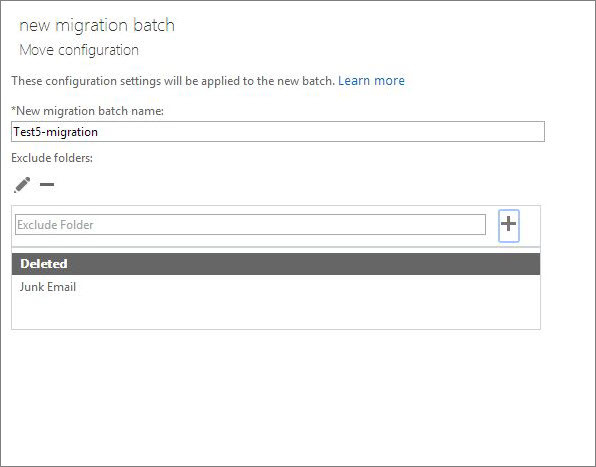 On the Move configuration page, type the name (no spaces or special characters) of the migration batch in the box—for example,Test5-migration. The default migration batch name that’s displayed is the name of the migration file that you specified. The migration batch name is displayed in the list on the migration dashboard after you create the migration batch.You can also enter the names of the folders you want to exclude from migration. For example, Shared, Junk Email, and Deleted. ClickAdd to add them to the excluded list. You can also use the edit icon to change a folder name and the remove icon to delete the folder name. NOTE: If the status shows Syncing for a long time, you may be experiencing bandwidth limits set by Google. For more information, seeBandwidth limits. Go to the Office 365 sign-in page, and sign in with your user name and temporary password. Update your password, and set your time zone. It’s important that you select the correct time zone to make sure your calendar and email settings are correct. When people outside of your organization send you email, their email systems don’t double-check where to send that email every time. Instead, their systems save the location of your email system based on a setting in your DNS server known as a time-to-live (TTL). If you change the location of your email system before the TTL expires, the sender’s email system tries to send email to the old location before figuring out that the location changed. This can result in a mail delivery delay. One way to avoid this is to lower the TTL that your DNS server gives to servers outside of your organization. This will make the other organizations refresh the location of your email system more often. The place to change the TTL setting is on your email system’s mail exchanger record, also called an MX record. This lives in your public facing DNS. If you have more than one MX record, you need to change the value on each record to 3,600 seconds or less. Don’t worry if you skip this task. It might take longer for email to start showing up in your new Office 365 mailboxes, but it will get there. 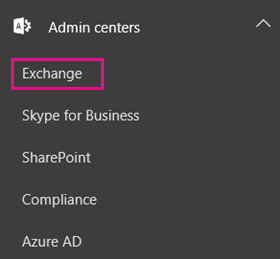 For many DNS providers, there are specific instructions to change your MX record, see Create DNS records for Office 365 when you manage your DNS records for instructions. If your DNS provider isn’t included, or if you want to get a sense of the general directions, general MX record instructions are provided as well. See Create DNS records at any DNS hosting provider for Office 365 for instructions. Go to the Domains page. Select your domain and then choose Fix issues.The status shows Fix issues because you stopped the wizard partway through so you could migrate your Gmail email to Office 365 before switching your MX record. After you’ve added all the records, you’ll see a message that your domain is set up correctly: Contoso.com is set up correctly. No action is required. Make sure that your users are using Office 365 exclusively for email. After you delete the migration batch, email that is sent to Gmail mailboxes isn’t copied to Office 365 This means your users can’t get that email, so make sure that all users are on the new system.